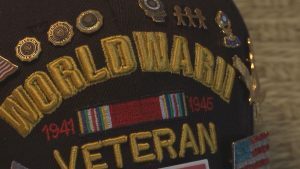 MEDFORD, Ore. – A group of local veterans are back from a special trip to Washington, D.C. Honor Flight of Oregon takes veterans to their memorials on the National Mall as a “thank you” for their service. The group took off Friday and returned to Medford just after 11:00 Sunday night. They were greeted with signs, cheers, and hugs. The Honor Flight of Oregon made a special announcement to possibly have two trips next year. One in the fall and one in the spring.